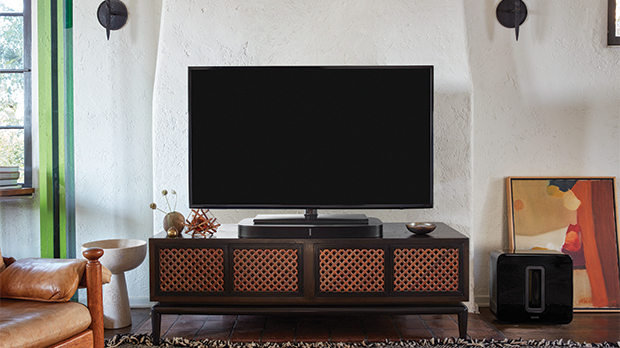 PLAYBASE has a slim, tabletop design that blends perfectly underneath your TV. PLAYBAR looks great mounted on the wall. Either way, you’ll hear all the details: the full range of sound effects and music from the left and right channels, and crisp, clear dialogue from the centre. PLAYBASE and PLAYBAR amp up every movie, game and TV show with widescreen, 3-channel sound. 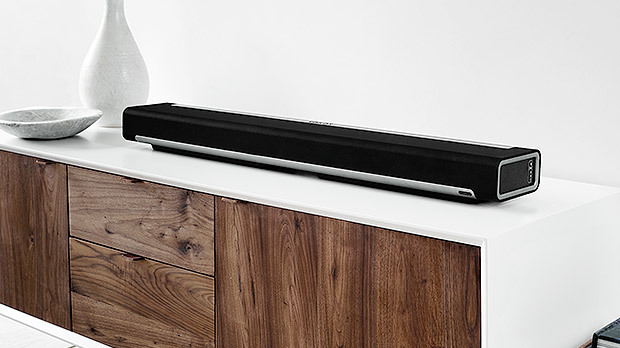 PLAYBAR is perfect on its own but ready to welcome any new Sonos additions into the fold. Add a Sonos SUB for soul-shaking sound. 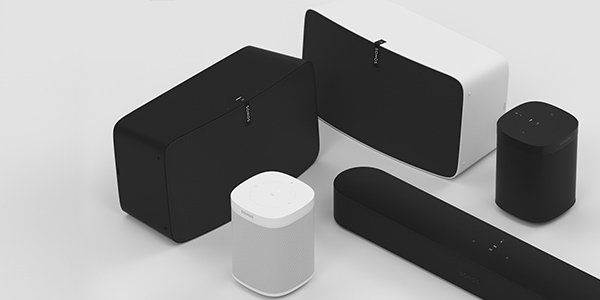 The stunning Sonos SUB - designed to be compatible with Sonos PLAY and PLAYBAR systems - employs two face-to-face, force-cancelling speakers to fill the room with deep, thick sound so you can feel and hear every nuance of songs and movie audio. 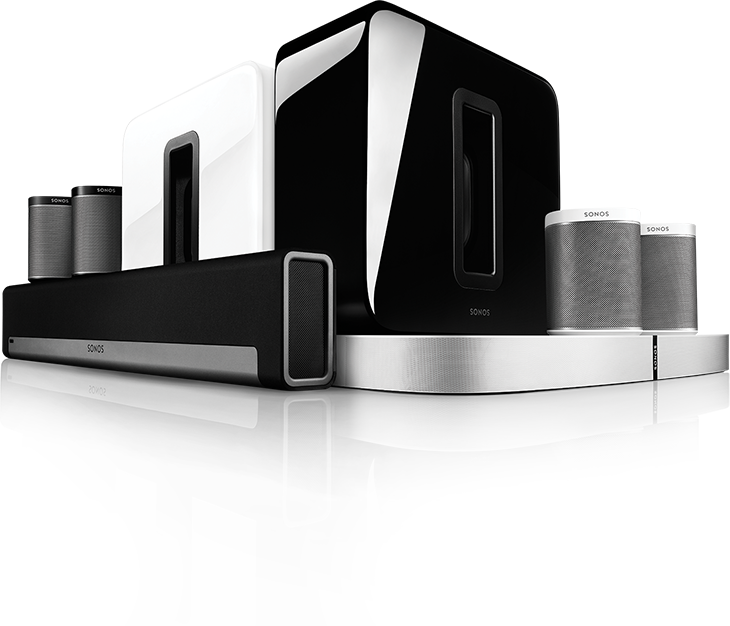 You can even use the versatile Sonos speakers to create your own wireless home cinema system. By adding the SUB to the PLAYBAR you create an enhanced 3.1 home theatre setup. Add a stereo pair of PLAY:1s or PLAY:3s and you will have an incredible, compact 5.1 system. 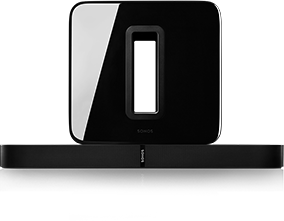 Place the speakers where you want and combine the power of your Sonos speakers in one immense unit. When your TV is on, enjoy epic, all-encompassing sound for movies and gaming. And when it's off, experience brilliantly crystal-clear music. PLAYBAR delivers cinematic sound for all your movies, TV shows, sports and games - and wirelessly streams your favourite music too. 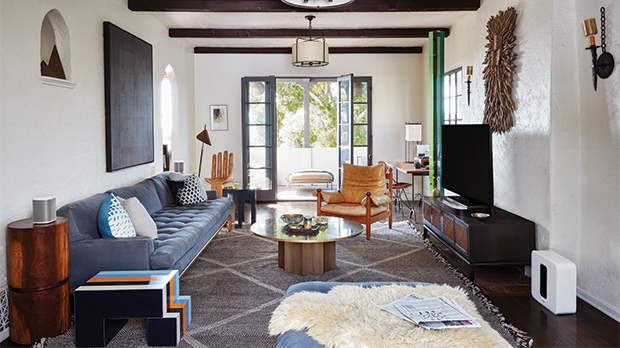 Full cinema sound for TVs on stands and furniture. And streams music, too. The slim, low-profile design blends in prefectly beneath your screen, yet it amps up movies, TV shows and games with that all-encompassing sound you just can't miss. 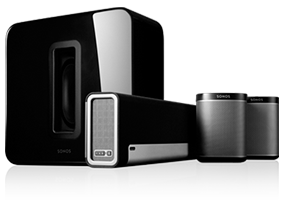 SUB's ultra-deep, soul-shaking lows allow your other Sonos speakers to focus on the mid and high-range frequencies. You won't just hear the difference. You'll feel it. 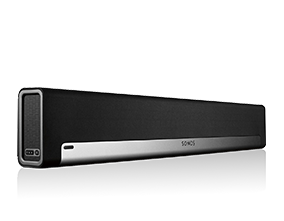 Our Sonos soundbar and soundbase amp up every movie, game and TV show with all-encompassing, 3-channel sound. You’ll hear the full range of sound effects and music from the left and right channels, with crisp and clear dialogue from the centre. Nothing cements your home cinema audio together like dynamic, highly detailed bass. Combine SUB with either PLAYBAR or PLAYBASE to experience each boom, crash and rumble in all its thunderous glory. Now we're talking full-on surround sound. Total sonic immersion. Add a pair of PLAY:1s, PLAY:3s, or PLAY:5s to PLAYBAR/PLAYBASE and SUB – suddenly you're right in the centre of the action with vivid sonic details coming from every direction.